It is no secret that I love ecoSTORE USA. My entire family bathes in their body washes, uses their shampoos and conditioners in our hair and I only wash my laundry in ecoSTORE USA Laundry Liquid. One could say that I am hooked! ecoSTORE USA manufactures all of their products in Michigan and who doesn't love to support a US company?! ecoSTORE USA products provide safe, healthy alternatives to everyday brands, while at the same time featuring outstanding performance and value for the dollar. All ecoSTORE USA products are plant and mineral based and free of toxic ingredients. That is a HUGE bonus in my book! I also love that all orders over $25 ship free to the US and Canada!!!! ecoSTORE makes 5 different bar soaps: manuka honey, lemongrass, coconut, vanilla and baby (goat's milk). Each one is AWESOME but I especially love the manuka honey and baby. The manuka honey has wheat germ flakes in it for extra exfoliation! Who wants to win 12 bars of this amazing No Nasty Chemicals™ soap? Open to US and Canada! Ends 3/6 GOOD LUCK! I'd love to try Eco's Pear Conditioner. Everything looks awesome. I guess I would like to try the soaps first..Im not one for jumping into things quickly. I'd like to try all their products! Especially the personal care products and pet products. My favorite shampoo is the Honey & Almond from ecoSTORE USA! I loooove their soaps! The coconut one smells so good, but I'd love to try all the others, too. I love natural soaps and have a huge affinity for ones with oats and/or plant fragments that help to exfoliate. I'd love to try the no nasty chemicals soap! Aw Dexter! So cute! :) Great giveaway opportunity! Oh my! I am a soap junkie. those look fab ! I would love to try any of them. I am not picky and I love their products. 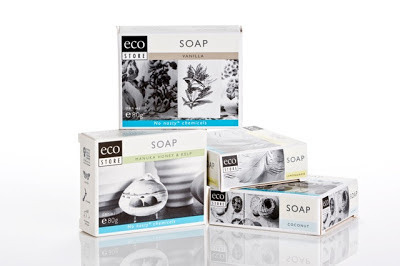 I'd love to try all of ecoStore's products. I'm interested in trying just about everything they have but would like to start with body and hair care products. I'm interested in trying just about all of their products but more interested in body and hair care products to start with. I would love to try the all purpose cleaner and the glass cleaner. I am already a user of many of the other products. I like their soaps so next I would like to try the body wash. It's hard to decide but it would have to be the laundry detergent, I have not found one yet and i don't like suing the pones at the grocery store. Love the baby sleepytime bath! I would love to try the Pear shampoo and conditioner! I love the cute little video! I would love to try the laundry liquid. I'm always on the lookout for good laundry soaps as we wash a lot of laundry and I want good stuff touching my kiddos bodies. I'd like to try the laundry detergent and whitener. The coconut soap. I am in love with all things coconut right now. I already use the shampoo and liquid hand soap. I didn't realize they had bar soap, so that will be next on my to try list. I love their Manuka Honey & Kelp bar soap! I would love to try their Honey Almond Shampoo & Conditioner! Thank you for this giveaway! Now I want to try to Manuka honey soap...I love Manuka honey! anything, but I'd start with personal care products. this looks like it would be cool! I would love to try the Coconut & Vanilla Body Wash and also the Manuka honey soap. Both sound wonderful! I would be interested in trying the toilet cleaner. I have yet to find an eco-friendly option that works well. I would love to try the Vanilla Bar Soap! The pear conditioner looks yummers. I love the ecostoreusa baby lotion...for myself! I have been a customer for a few years. Great products!Shawn t.
I haven't tried anything yet. So, I'll try any of the products! I would love to try the Vanilla Bar Soap. Would love to try all the products especially the soaps. I'd love to try their hair care products, especially the Pear Conditioner. I want to try the Honey & Almond Shampoo and Conditioner. We've tried their baby products but I've been wanting to try their adult shampoo & conditioners. I really want to try their Cucumber Shampoo! I'd love to try the Baby Nappy Balm. Their shampoos and conditioners. Especially the pear scent. The oxygen whitner and Baby balm I have tried and love. I would love to try their shampoos. I would like to try Pure Oxygen Whitener for a safe, effective alternative to chlorine-based bleach. Herbal Fresh Shampoo for my dog! I'd like to try the Pear Shampoo. I would love to try the Hypoallergenic Shampoo for dogs! I'd love to try the Coconut & Vanilla Hand Wash. I would like to try the Hypoallergenic Shampoo for my pet! theRose & Cardamon Body Wash! I'd like to try the bar soaps! I would love to try the Cucumber Shampoo and Conditioner!